Justice Aloma Miriam Mukhtar has been nominated by the President of Federal Republic Of Nigeria, Goodluck Jonathan as the first female chief Justice Of Nigeria to be. If her appointment is senate-approved, the 68 year old woman will be make history as the first female Chief Justice Of Nigeria. 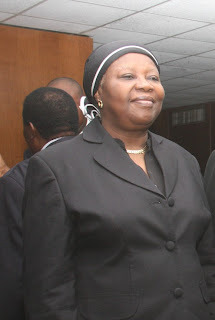 She’ll be replacing the current CJN, Justice Dahiru Musdapher as he’s set to retire on July 16th, 2012. It’s a perfect choice, for me, made by mr President Goodluck Asikiwe Johnathan to had choose a female Justice to inherit the CJN sit, it will be a remakable one though we need a change,thus lets try something different and see what it will come up with. I MUST SAY THAT I SUPPORT THE IDEA GOD BLESS NIGERIA.